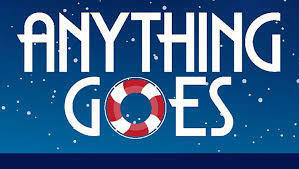 The High School VPA Department proudly presents the Broadway musical production Anything Goes. Anything Goes features the music of Cole Porter. The 1950’s movie version of Anything Goes starred Bing Crosby and Donald O’Connor. Performances will take place on February 7, 8, & 9 in the Gardiner Area High School Little Theater. Performances will begin at 7:00 p.m. each evening. Tickets are $10.00 for adults and $5.00 for senior citizens/students. Children under 5 years of age are free. Tickets may be purchased at the door, at the G.A.H.S. Music Department office, by emailing dwalker@msad11.org, or by calling 582-3150 ext. 3027. Tickets for the performances are on sale beginning Monday, January 28th. Seating is reserved and tickets will go fast so get your tickets early! Enjoy an entertaining evening of music, humor, fun, and help support the members of the cast as Gardiner Area High School presents its annual Broadway Musical!